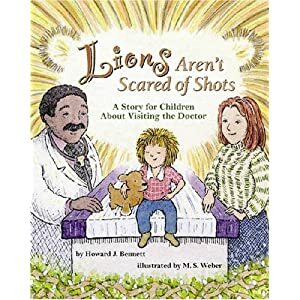 Lions Aren’t Scared of Shots « Howard J. Bennett - Pediatrician and Author in Washington, D.C.
Molly is worried. It’s time for her yearly checkup and she doesn’t want to go. Molly likes Dr. Ryan, but she doesn’t like shots! With the help of her imagination and her dog, Cinnamon, Molly finds her courageous inner lion right when she needs it the most.The book includes an endnote for parents that provides advice and tips for encouraging children to feel comfortable and brave during routine checkups, sick visits, shots, and other medical encounters. The book was featured in the December 3, 2006 issue of Newsweek Magazine and a story about pain control on the Today Show.